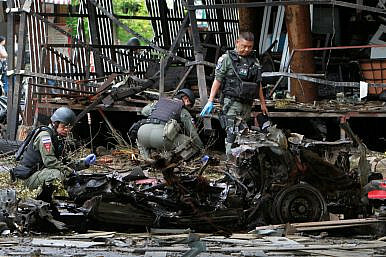 Thai soldiers inspect the scene of a car bomb blast outside a hotel in the southern province of Pattani, Thailand (August 24, 2016). More than a fortnight since anonymous assailants launched lethal bombing attacks across seven southern Thai provinces, authorities have yet to provide a coherent narrative for who was behind the death and destruction — and whether the country’s crucial tourism industry is at risk of a repeat attack. While top junta officials deny that Muslim insurgents active in the country’s southernmost provinces were responsible, there is still scant evidence to support the regime’s claim that “political groups” opposed to military rule masterminded the blasts. Similar to the official response to last year’s Erawan shrine bombing, Thailand’s worst ever terror attack, which killed 20 and injured over 125 people in Bangkok, military leaders and police investigators have sent mixed messages about suspects, evidence, and motives. While junta officials have pointed toward groups affiliated with the coup-ousted Peua Thai Party, its “Red Shirt” pressure group, and its aligned “Wadah” faction based in the country’s Muslim majority deep south, police probes have mainly implicated the Barisan Revolusi Nasional (BRN) insurgent group. Those conflicting signals have raised questions about whether security agencies are working at cross purposes in competitive and potentially politically motivated investigations. Long-running military-police rivalry has intensified since the 2014 coup, with many police-controlled businesses and criminal rackets upended by the ruling junta in the name of fighting corruption. Police interests have been squeezed by the junta in part because the force is still viewed as a power base of self-exiled ex-premier Thaksin Shinawatra, with potent potential to organize and stoke instability through shadowy violence. The August 11-12 bombings bore hallmarks of past BRN attacks in the deep south, including coordinated assaults across wide geographic areas and staggered bombings that aim to hit officials who respond to an initial blast. Some junta officials believe BRN may have acted in league with either Peua Thai or UDD operatives to express mutual discontent with the August 7 passage of a military-backed constitution. Peua Thai, the United Front for Democracy Against Dictatorship (UDD), and Wadah faction leaders have all denied they were involved in the bombings, which were detonated symbolically to coincide with Queen Sirikit’s national “Mother’s Day” birthday celebrations. Panitan Wattanayagorn, security adviser to Defense Minister Gen. Prawit Wongsuwan, told The Diplomat that military intelligence agencies had picked up signals ahead of the referendum that Peua Thai may be plotting to destabilize the vote. The adviser claims that former army commanders and Peua Thai loyalists Gen. Chaiyasit Shinawatra and Gen. Chavalit Yongchaiyudh were “unusually active” ahead of the poll. Chaiyasit is Thaksin’s cousin; Chavalit is a former premier with strong political links to the Wadah faction who has long advocated for autonomy-devolving peace prescriptions for the restive southernmost region. Diplomats and security analysts doubt that Peua Thai or UDD could have organized such a sophisticated, multifaceted attack so soon after the referendum result, particularly in a region where the party habitually loses elections and lacks significant grass roots support. Panitan counters that Peua Thai’s internal polling showed that the referendum would pass well in advance of the actual vote and thus there was ample time to organize a protest attack against a “yes” result as a contingency. He said officials “let down their guard” after the referendum passed without violent incident or political challenge. If BRN acted alone, as some diplomats and analysts suspect, it would mark a dangerous escalation of the insurgent group’s 12-year armed struggle against Bangkok rule. Attacks to date have been almost exclusively confined to BRN’s remote geography, namely the southernmost provinces of Narathiwat, Pattani, and Yala, with less frequent assaults on adjacent Songkhla. The group has mainly avoided Western targets that could internationalize the local conflict. Analysts are still uncertain if the attacks should be interpreted as a one-off warning or first strike in a sustained campaign on the southern region’s tourism industry. While junta officials have consistently denied the “Mother’s Day” attacks represent a shift in insurgent tactics, Prime Minister Gen. Prayut Chan-o-cha appeared last week to extend a certain olive branch through the creation by executive order of a new special panel tasked with preventing threats against all religions. A provision in the new charter prioritizes protecting Buddhism over other religions, including Islam, a measure inserted by charter drafters in a nod to increasingly assertive Buddhist nationalists. The provision is believed to have contributed to the strong vote against the charter’s passage in the three southernmost provinces. It is unclear if that particular provision or the charter’s guarantee of sustained military rule even after new elections may have motivated BRN to launch the unprecedented attacks up the country’s southern coast. Some analysts believe a lack of progress in stalled junta-insurgent talks could also have been a contributing factor. A massive car bomb attack on August 23 in Pattani town — larger than any of the Mother’s Day bombings — coincided with a government plan to resume the so-called Kuala Lumpur talks, a process in which BRN is only marginally represented and hence has done little to stem the region’s violence. If there is another apparent insurgent attack on southern Thai tourist sites, Malaysia’s role will inevitably come under closer scrutiny. Adviser Panitan, citing intelligence reports, says that most of the bombs deployed in the Mother’s Day attacks were assembled and then moved across the border from Malaysia. Many of the low-grade bombs recovered at attack scenes were triggered with ignition devices that used hard-to-trace Malaysian rather than more closely surveilled Thai mobile SIM cards. A security analyst with contacts at a Malaysian mission in Thailand said envoys there believed a faction of BRN was involved in the attacks. On August 16, Prayut met with his Malaysian counterpart Najib Razak in Kuala Lumpur, but no details of the discussions were reported. While Bangkok has long pressed Kuala Lumpur to nab and extradite insurgents who operate along their shared border, Malaysian authorities often claim they are unaware of who is who in BRN’s opaque organization and headless leadership, according to a peace process source. Insurgents appointed by BRN to liaise with Malaysian Special Branch police — known for their sympathy, if not support, for BRN’s cause — are usually cut off from their previous Thailand-based cells and hence lack up-to-date information on the insurgency’s personalities and plans, the source says. On August 29, Thailand and Malaysia announced they would soon sign a bilateral pact to build a security wall along their shared border, enhance cooperation in combating transnational crime, and tackle thorny issues related to people holding dual Malaysian-Thai nationality in border areas. Defense Minister Prawit sealed the agreement with Malaysian Deputy Prime Minister Ahmad Zahid Hamidi ahead of the scheduled resumption of talks this Friday between Thai authorities and the insurgent umbrella group Mara Pattani. The memorandum is expected to be formally signed when Najib visits Thailand on September 6. Prawit’s role in cinching the pact, which if implemented would hobble BRN’s ability to use Malaysia as a staging ground and sanctuary, is notable in light of his consistent denials that southern insurgents were responsible for the Mother’s Day blasts. Some diplomats believe the junta’s failure to prevent the bombings and its disjointed response to the attacks have hit Prawit in particular as the regime’s top official in charge of security. Those perceptions, they say, may have contributed to the top brass decision to bypass Prawit’s preferred candidate, army chief-of-staff and fellow Queen’s Guard Gen. Pisit Sithisan in favor of army assistant commander and special warfare unit veteran Gen. Chalermchai Sittisart to become the next army commander. The reshuffle takes effect on October 1. Other analysts believe BRN may have extended the potency and range of its attacks with an eye toward the royal succession. Recent candid Royal Household reports on 88-year-old King Bhumibol Adulyadej’s ailing health and signs that heir apparent Crown Prince Vajiralongkorn has taken a more active role in certain royal institutions has signaled to some that the transition is drawing nearer. When the post-Bhumibol order is eventually determined by military top brass, royal advisers, and political powerbrokers, BRN may be pressing for a voice in the discussions by staging more destabilizing attacks, the analysts say. As long as BRN operates in the shadows, the motivation behind anonymous attacks will remain open to wide-ranging interpretations. Junta authorities have filled the post mortem silence surrounding the Mother’s Day bombings with their preferred narrative: that political groups marginalized by the regime’s referendum success staged the attacks in a rage of political pique. It also fits with the junta’s line that the long-running southern insurgency is a tightly contained domestic dispute that can be handled internally without outside intervention. To be sure, both sides of Thailand’s political divide and competitive military factions are known to have connections to insurgent groups and their associated criminal syndicates. And both have leveraged those underground links in the course of Thailand’s decade-old political conflict to undermine rivals in Bangkok and the region. But until junta authorities offer more credible evidence of the culprits, masterminds, and motivation behind the unprecedented string of lethal bombings, few will have confidence that the Mother’s Day blasts will necessarily be the tourism-dependent region’s last. Weapons from the insurgency in southern Thailand are making their way to ISIS-linked extremists in Malaysia.